Essentially, to morph from one sound to another is to modify the settings of a hardware or virtual instrument or effect while it is playing. The difference between crossfading (which we covered last month) and morphing, is that during a crossfade you hear a mix of two sounds, whereas when morphing, you hear the characteristics of one sound changing. For example, if the sounds with which you begin and end have different pitches, you'll hear a chord when crossfading, but you'll hear the pitch sweep or jump when morphing. Many virtual-instrument presets use the MIDI pitch-bend wheel to morph between pitches as well as having the MIDI mod wheel (CC1) set up to morph basic parameter settings such as filter cutoff, LFO amount or panning. But these only scratch the surface of what you can do with morphing. Fully featured instruments often include a complex routing matrix as well as robust MIDI-mapping capabilities and even built-in morphing schemes (examples include Native Instruments Reaktor, Camel Audio Alchemy, Linplug Morphox and Propellerhead Reason Combinators). 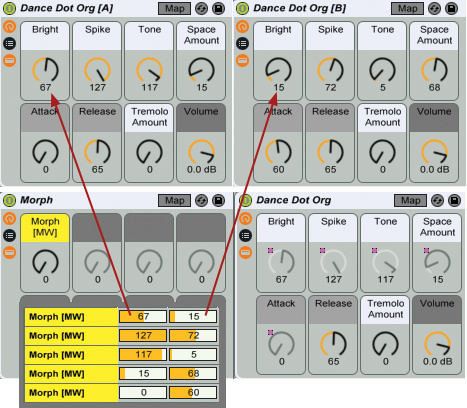 You can still set up complex morphing in Live for instruments without these features, as long as they allow their settings to be MIDI controlled or mapped to the Macro knobs of Live racks. Turn on MIDI Map mode with the MIDI button at the top right of the Live window (Command-M/Control-M). One by one, select each Macro knob you want to include in morphing and move the mod wheel slightly to assign it to that Macro knob. When the assignment appears in Live's Browser, set its Min value to the Macro knob's current value. Turn off MIDI Map mode and use the Macro knobs to dial in the sound you want to morph to. Do that with your mouse or a control surface such as Live's Push, but do not touch the mod wheel or you will obliterate all your edits. Now turn on MIDI Map mode again and enter each knob's current setting as the Max value in the mod-wheel mapping assignment shown in the Browser. Finally, turn off MIDI Map mode and use the mod wheel to morph between the Min and Max settings. The downside to setting up morphing directly using MIDI mapping is that MIDI mappings are not saved with presets or tracks; they are only saved as part of your Live song. If you want to save a morphing setup, one way is to enclose the target instrument or Instrument rack in a new Instrument rack and to map a single Macro knob in the new rack to all of the controls to be morphed, using the same Min and Max values as you would when assigning the mod wheel directly. 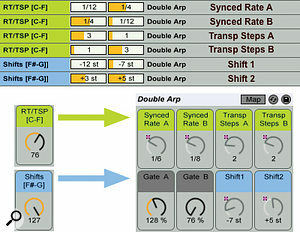 Because you cannot assign the morphing Macro knob's Min and Max values in two separate steps, start with the MIDI mod-wheel mapping just described, make a note or take a screenshot of the MIDI map's Min and Max values, use those to set up the Macro knob and then delete the MIDI mod-wheel mappings. When you save the new Instrument rack, its morphing Macro knob settings will be preserved. To then use the mod wheel (or other MIDI controller) for morphing, just assign it to the morphing Macro knob each time you load the rack. Rack Macro knobs are ideal for mapping to continuous controllers such as knobs, sliders and numericals, but some care must be taken when using them with buttons switches and controls that have a discrete number of steps such as drop-down menus. Buttons and switches are in their On positions when the Macro knob is within its Min to Max range. That's very handy when you want to use a Macro knob to control some device settings as well as to turn the device off when it's not in use; simply assign the Macro knob to the device's Activator button and set the knob's Min and Max to one and 127, respectively. Twisting the Macro knob full left (value zero) then deactivates the device, whereas all other settings keep it activated. Macro knobs assigned to drop-down menus have no range setting; they always scroll through the entire menu. As a partial workaround you can assign a MIDI key range to the Macro knob, and by including the same number of keys in the range as items on the menu, use individual MIDI notes to select specific menu items. Macro knobs assigned to knobs calibrated in discrete steps do offer range settings, and you can use the same trick — key-range MIDI assignments — to select steps within the range you set. As with instruments, you can set up morphing for MIDI and audio effects, and the racks in your Live Packs library are a good place to start. You can build stand-alone morphing Effect racks, but adding effects to an instrument rack is another option. Insert MIDI Effect racks before the instrument and insert Audio Effect racks after it. If the instrument is already enclosed in a rack set up for morphing, you can use that rack's other Macro knobs for MIDI and audio effects morphing. In screens 2 and 3, I've added the Double Arp MIDI Effect rack and the Major Wah Audio Effect rack from Live's Core Library pack to the morphing Dance Dot Org rack. 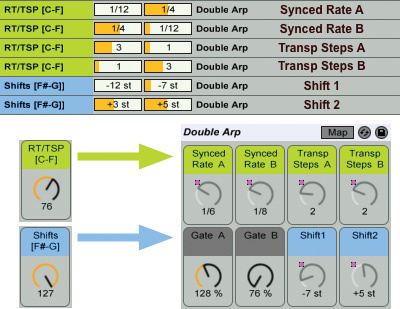 Double Arp arranges two Arpeggiator effects in parallel and follows one of them with a Chord effect, which adds two accompanying notes to each arpeggiator step. I've mapped the arpeggiator rates and octave-transpose ranges to one morphing knob and mapped the selectors for the two Chord effect notes to another. I've then MIDI mapped these two morphing knobs to MIDI note ranges, which lets me quickly select specific arpeggios and chords. In my setup, the octave at the bottom of the MIDI key range (C2 to B2) is convenient for this, but you can choose any range. The Major Wah rack uses Live's Auto Filter and EQ Eight devices to simulate a wah-wah pedal, with the motion supplied by Auto Filter's built-in envelope generator and LFO. The morphing knob, Wah, which I've mapped to a MIDI Expression pedal (CC11), fades the envelope in and the LFO out while also lowering the filter cutoff. At the pedal extremes only the LFO or the envelope is heard, whereas all other positions yield a combination of the two. One additional Macro knob, Arp/Wah, is mapped to the Activator buttons for Double Arp and Major Wah with range settings that allow any combination of the two effects to be active. That knob is mapped to MIDI key range G# through B. In summary, an octave of the MIDI note range is used to select the arpeggio settings and select the active effects. The mod wheel morphs the instrument sound and the Expression pedal morphs the wah-wah effect.